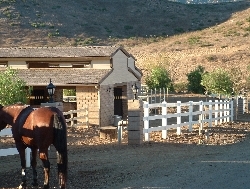 Elite Show Stables is located at beautiful Peppertree Farms (formerly Lucidi Farms) in Poway, California. Located on the corner of CA-67 and Poway Road, it is 25 minutes away from the Del Mar horse shows and a short drive from much of San Diego. 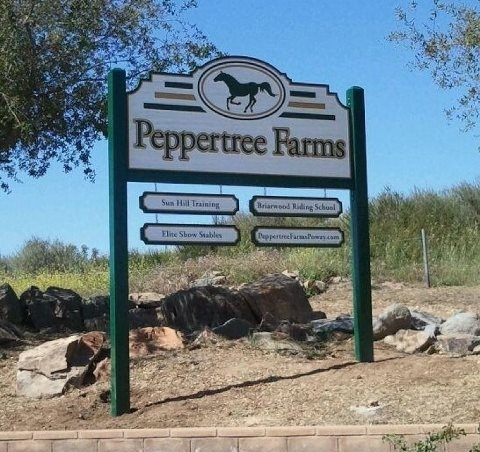 Peppertree Farms is a 30 acre equestrian complex, with access to 60+ miles of scenic trails. The facility consists of 6 barns, one of which is used by Elite Show Stables. Amenities include 5 sand arenas that are groomed on a daily basis, lights in all the arenas for evening riding, and top quality hay. Ceiling fans keep the barns cool in the summer and the custom-built block barns stay warm and dry in the winter. The horses and facility receive the utmost care, with improvements to the property ongoing daily. You will not find a facility of this caliber in eastern San Diego County, which can be enjoyed at a very fair price. "There's something about the outside of a horse that's good for the inside of a man."